Call it the anti-Uber model. Office cleaning startup Managed by Q is taking a different approach to the service economy. "Q" -- as its employees refer to it -- takes a tech-enabled approach to cleaning. Its business customers rely on it to keep track of cleaning and office supplies, request handymen, and schedule cleanings. It's all managed via an iPad. And Managed by Q hires its employees. That's a different approach from Uber and the majority of on-demand firms. They rely on contract workers -- which means they don't have to offer benefits, sick leave or guaranteed hours. The contract worker structure has been under fire. Just this week it came to light that the California Labor Commission said a San Francisco Uber driver was, in fact, an employee. This case could have significant implications for Uber and others with similar models. Q offers a starting wage of $12.50 per hour in New York, for example, plus benefits like 401k plans, flexible hours and even free college courses. Wages for maintenance duties start at $40 per hour. "We realized fairly early on that in order to deliver the best quality of service, we needed to be the best employer," said Q co-founder Dan Teran, 26. The startup, which launched in December 2013, already has over 150 employees. They're adamant not just about rapid growth, but creating a company that employees want to stay at long term. 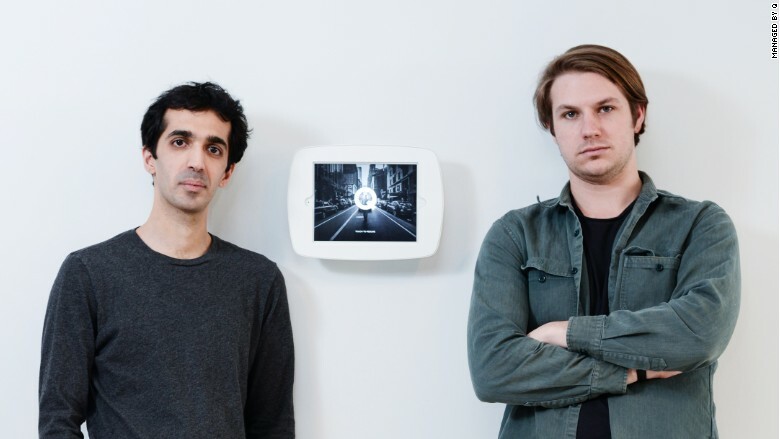 "One of the fundamental principles is that we do not have a divide between our headquarters and our labor," said co-founder Saman Rahmanian, 33. "All of us are operators. We have office operators and field operators." All workers have access to Q's headquarters -- to grab a coffee or just relax in between shifts. The company also offers on-the-job training. "You can have people progress from the field into the office," said Rahmanian. "If you have a divide, you're limiting their progression." Q's approach could serve to mitigate the ennui that contract workers often feel. Flexible work hours is the number one reason why workers picked their current employer, according to a recent study of 1,000 contractors who've worked for companies like Uber and Lyft. It even outweighed factors like higher pay and location. "No one says as an employer you can't let people choose their hours," said Teran. "It's a choice you make as an employer." Q lets its employees work a set weekly schedule if they prefer, but it also lets them pick up last-minute shifts or cancel with 48 hours notice. And its employees seem content: it's had less than 1% turnover. 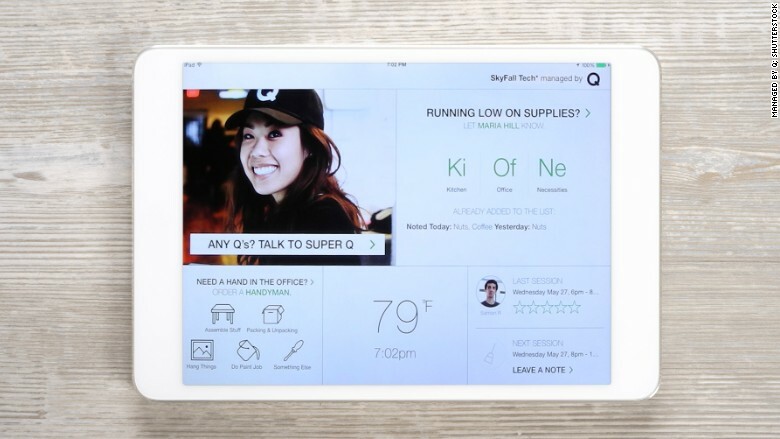 Managed by Q installs an iPad in offices granting office managers "super powers" to keep track of supplies and schedule cleanings. Its novel approach could be a major shift in the market. "The mainstream [model] is to use contract workers, but it's hard in an environment like Managed by Q," said Zeynep Ton, a professor at MIT Sloan School of Management. Ton researches how organizations can best run their businesses to suit needs of employees, customers, and investors, which she refers to as "operational excellence." She was so intrigued by Q that she is now an adviser to the company. It's significant for the startup. Her book, The Good Jobs Strategy, informed a lot of Q's policies, said Teran. That's why Ton is planning to conduct a case study at MIT to see how Q's model -- hiring employees instead of working with contractors -- scales as the company does. Ton said for the model to work, it'll require a continued investment in people. "There's definitely more upfront costs and you have to be more careful about growth," said Ton. "[But Q's model] could have a big potential impact -- especially in the startup world." Q's founders say they're up for the challenge. "We're focused on becoming the best employer in the world," said Teran.